On 9 May 2016, WHO, UNICEF and IBFAN had the pleasure to hold an evening of discussion on national implementation of the International Code of Marketing of Breast-milk Substitutes and subsequent relevant WHA resolutions at Geneva Press Club. Watch the event podcast on http://new.livestream.com/GvaPressClub/Breastfeeding. increasing breastfeeding rates could prevent an estimated 40 000 breast cancer deaths per year. In spite of its critical importance as the cornerstone of child health and survival, aggressive and inappropriate marketing of breast-milk substitutes, and other food products that compete with breastfeeding, continues to mislead parents and undermine efforts by Member States to protect and support children’s rights to health and ensure sound objective information. 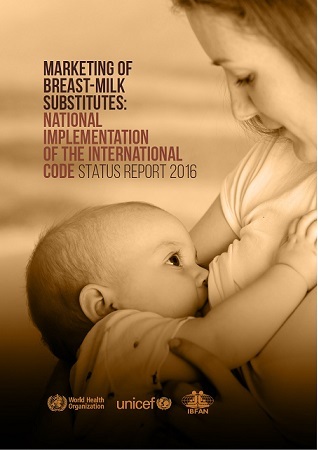 Implementation through effective regulation of the International Code of Marketing of Breast-milk Substitutes, adopted by the World Health Assembly in 1981, and the subsequent relevant WHA resolutions is essential if inappropriate marketing practices are to be eliminated. developing protocols and tools for Code monitoring and enforcement, providing direct technical assistance to countries, and advocating for complete adherence to the International Code. For more information on the panel, click here. The event was followed by a showing of the movie “Tigers”, sponsored by IBFAN.